Well first of all let me wish everyone a belated happy new year - lets hope its a good one. It's that time of year again where we need your support, at the weekend of the 25-26th March it's the Manchester bike show a little earlier than last year and we need about 12 bikes again for the stand. This area we have is the same size as was last year which is twice that of the early shows so the bikes won't be on top of each other. If you'd like to have your bike included send an email to Jon giving him details of your bike etc. YOU must be able to get your bike to Event City on the Friday and take it home on the Sunday after the show closes at 5pm. As you know Rainy Daze 13 was the last so there will be an empty spot in your calendar so keep an eye on the events and calendar pages as events start being announced they will be updated and of course for those weekend ride-outs. All the houses are booked for the Kulture Kruize , there is however one place available. Unfortunately someone has had to drop out - get in touch with Barry if you want to go. 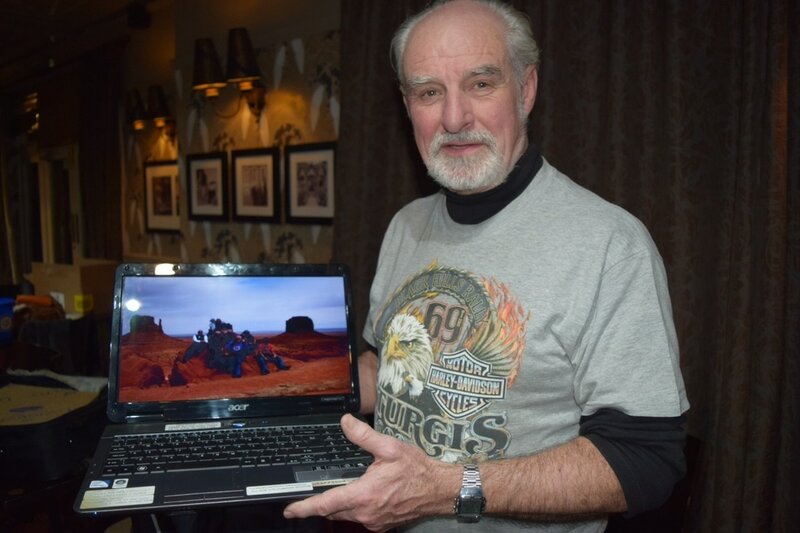 This months meeting was extra special as Norman gave one of his excellent talks on Sturgis. For those of you that went on the Rainy City Club trip to Sturgis in 2009 it will have brought back some good memories, for those that didn't it gave you an insight to what its like. Kenny made it to the winners list. and Nobby - another raffle prize. February club night was a well attended night. 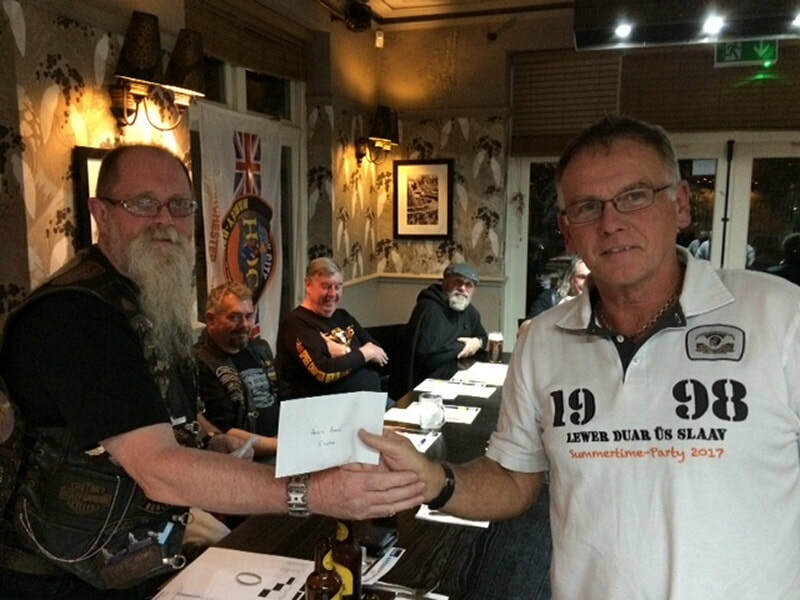 ​El Presidente - At last month’s committee meeting after 24 years on the committee with 15 of those as our President, Barry advised us that he wouldn’t be re-standing at the AGM in October. We all told him we would like him to stay and asked him to reconsider. 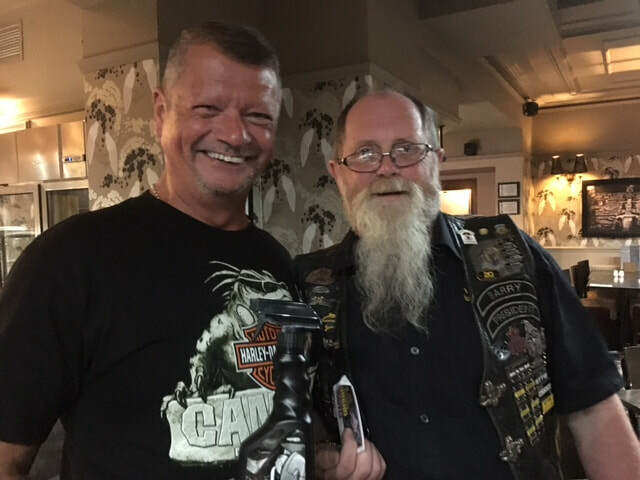 At last week’s meeting he confirmed that he hadn’t changed his mind and wanted to ride more and have time for all his other interests (Manchester United and the Shoe-box charity to name but two). 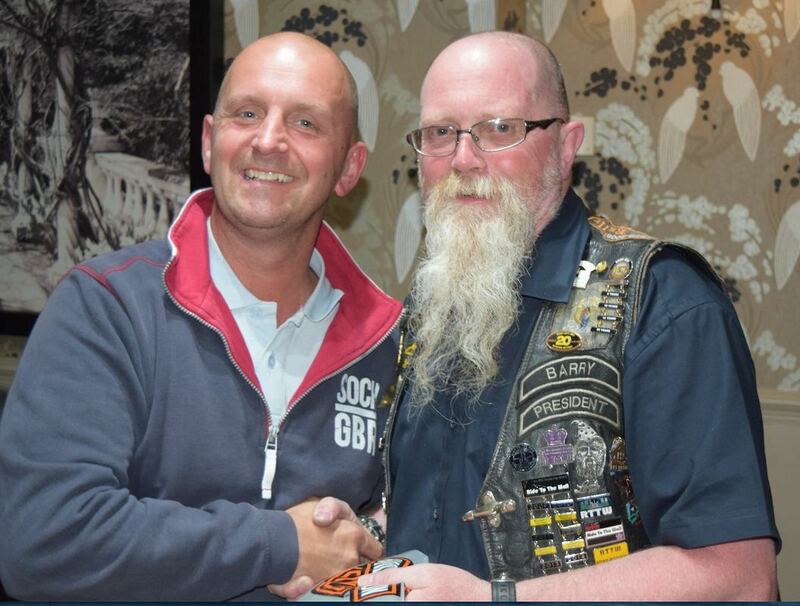 At the request of the committee, in recognition of all he’s done for the club and as a thank-you, Barry has accepted the position of Honourary Life President. We will be working with him over the next seven months to share out his duties and we’ll keep you informed. On a lighter note Chris McDonald hosted a live music quiz - no he didn't sing..! he played a selection of music, it made for a pleasant change. And the raffle winners were. Not much to report this month other than the Manchester Bike Show a big thank you to al that helped out with the set up on the Friday and the packing up on Sunday. It was a great success, if you've never been yet you owe it to yourself to go at least once. 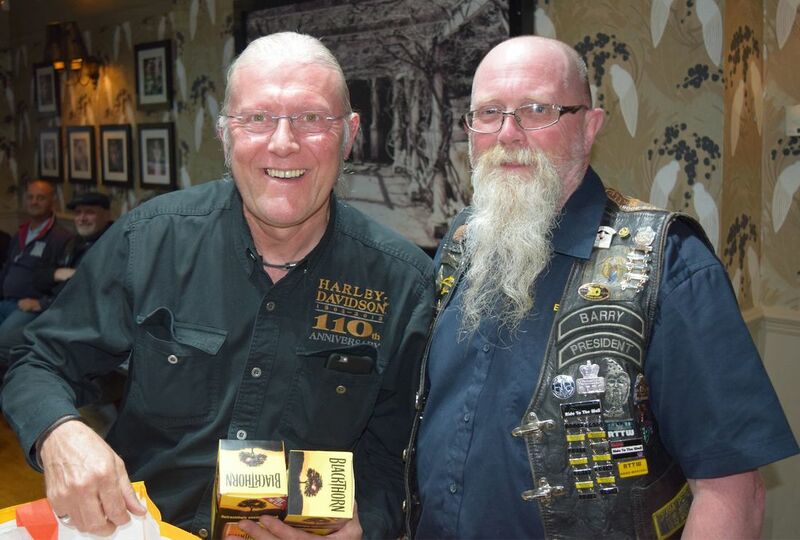 We had another success this year with Phil winning a prize with his custom painted Fat Bob - well done Phil. Carol makes it two for the ladies, could it be a clean sweep? Nah she can't, Adrian steps up to the challenge - well done. Bill.. you just had to do it didn't you..! Some guys have all the luck.... I think Robert Palmer said! 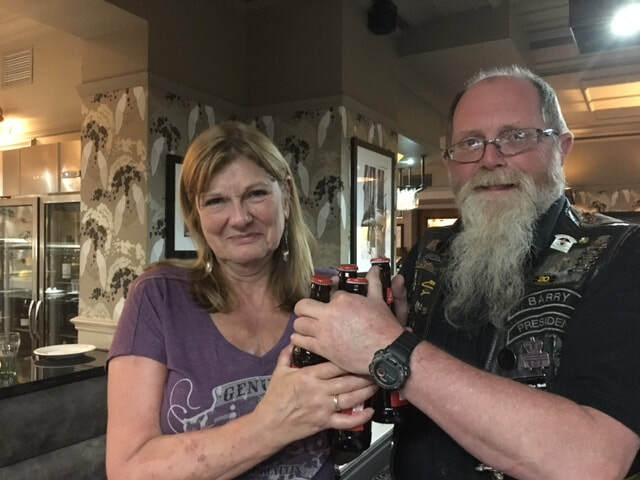 Doris Valentine, Roger & Tracey Barlow and Andy (Wiggy) Ponting welcome to you all we hope to see a lot more of you and hope you enjoy your new club. a plus & minus, the plus being we now have more control in that we don't have to bow to Billing Aquadrome's rules (previous venue) but on the minus side all we have is a massive field to fill. So what we have suggested is that Rainy City come down as a club and use our facilities to have a party weekend. The shows are from Friday to Sunday afternoon. all you have to do is pay your camping. See the flyer in the events page. 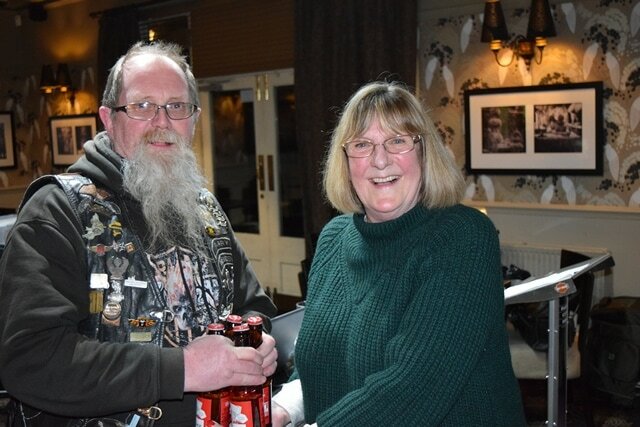 The quiz winners this month were Bill (again), Andy Andy (new member) and Anita (Andy's other half). Here she is collecting the prize. A while since Chris won - well done. 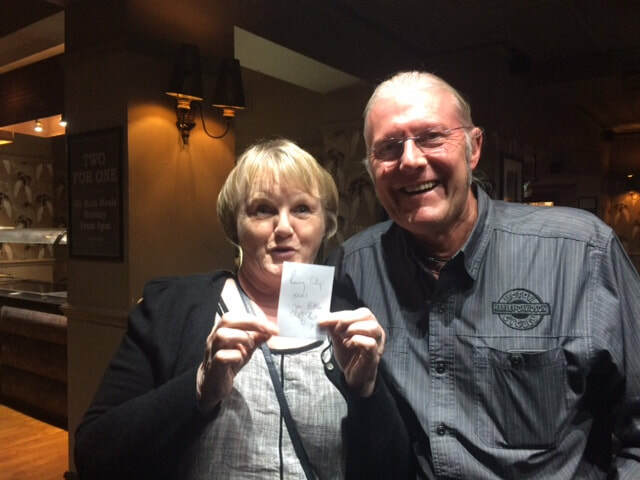 Iain is not a stranger to winning the raffle BUT it's his first win as a GRANDAD so congratulations on both counts. Tonights meeting was a bit smaller than normal probably due to half term and holidays I'm guessing. As the numbers were down we decided not to do the quiz and save it for next time. There was some news though, not all good I'm afraid. We all know and love Nobby, Barry informed us that his health was getting worse so he's decided to sell his bike and sidecar outfit, if anyone interested then drop Barry a line and let him know and 'm sure he'll pass your details onto Nobby. 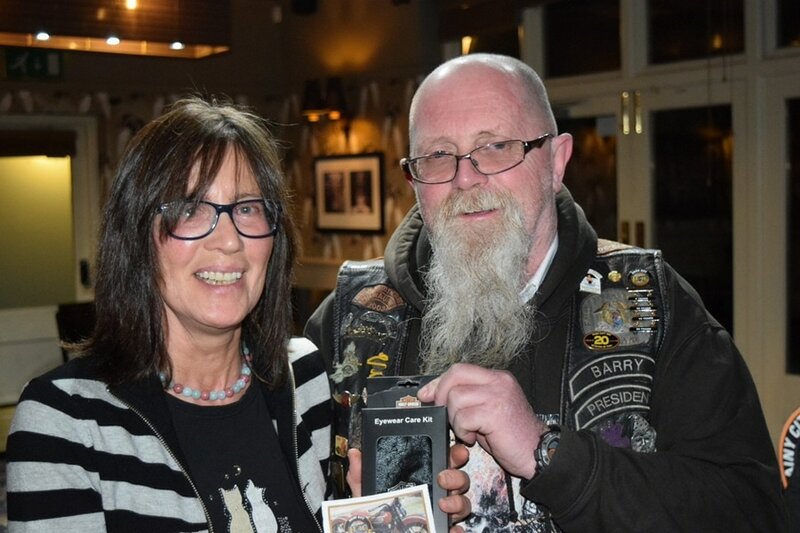 For those that haven't heard already at the Kulture Kruize Keith & Kath Mabey unfortunately came of their bike, low speed but as we know they are just as bad as high speed as the bike can fall onto you.They are both making a recovery, thankfully. On a more somber note Barry informed us that a couple were unfortunately killed when they hit a Range Rover head on (it was on the wrong side of the road) on the way back from the Wallace Rally. On a lighter note Chris is going to be doing another music quiz at the next club night so make sure you're back from your holidays and get on down to the Woodthorpe on June 27th. ​There was however the raffle and here are your winners. Long time since you won Jon. And a win to new member Roger Barlow. Well a pretty good turn-out tonight and a couple of new members. Chris Mac was playing host with another of his music quizzes which made for an entertaining evening, pretty difficult being in two sections - Car Parts or US States/Capitals as either the artist or the song/lyrics, mmm took some thinking about. We have two new members though I'm sorry I didn't get your names. Kath & Keith Maybe turned up making a welcome appearance after their recent accident at the Kulture Kruize. 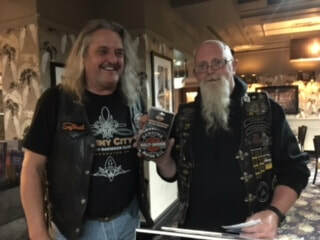 Kevin talked us through the latest flyers and events that were coming up - don't forget the Rainy City Road Trip get your booking form in ASAP. The latest issue of Hogwash was handed out so you should have your copy soon. 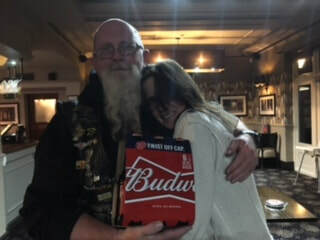 Well done Jean for winning the quiz - and for collecting the BEER..! A welcome back Keith - back to winning ways. One of our new members making a mark by winning on a first visit. Jon seems to be a regular raffle winner these days. Steve well done another win notched up. 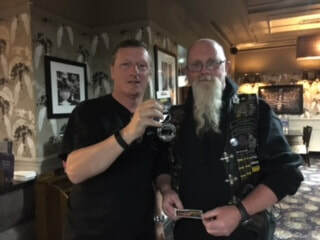 It was a fairly regular night with Ken presenting one of his 'WHO AM I' quizzes - it was a bit easier this time with more clues. Kevin read through the month's fliers (you should all have copies via email from Barry) and we had a couple of new faces. We had a few more bookings for the club BBQ at KELMARSH, so we should be well represented, hopefully! ​So here are this months winners. 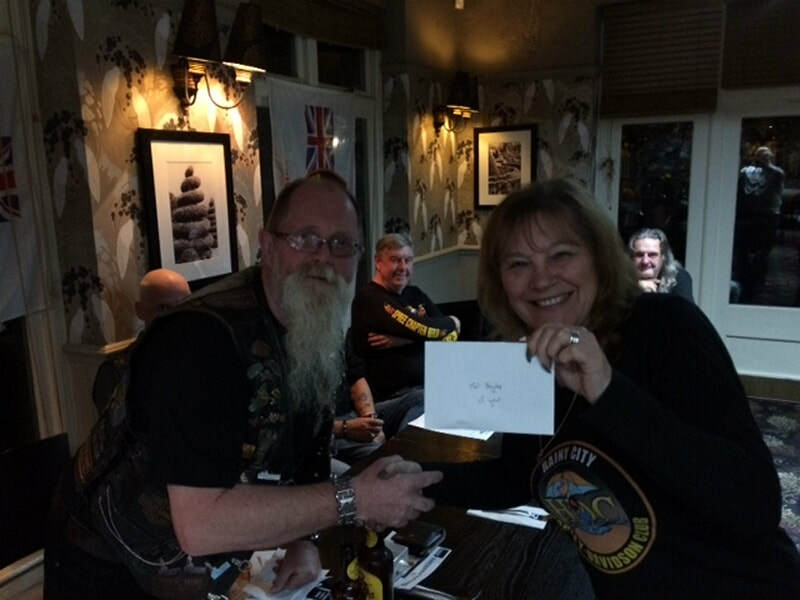 Here's Jean collecting the quiz prize- are they trying to say something Jean..? Steve you're becoming a serial winner..! Not seen Tony's smiley face wining the raffle for a while. Chris Mac opened the meeting in Barry's absence and reminded people that inside this month's HOGWASH were Membership Renewals along with COMMITTEE VOTING papers, and urged folks to complete them ASAP. He also reminded everyone that FREE FOOD would be available at the October AGM, but asked folk to confirm their attendance so we can order food quantities correctly. Chris also mentioned again about Barry's retirement as PRESIDENT and that the committee would be sharing Barry's duties as no-one wanted to succeed him as President. 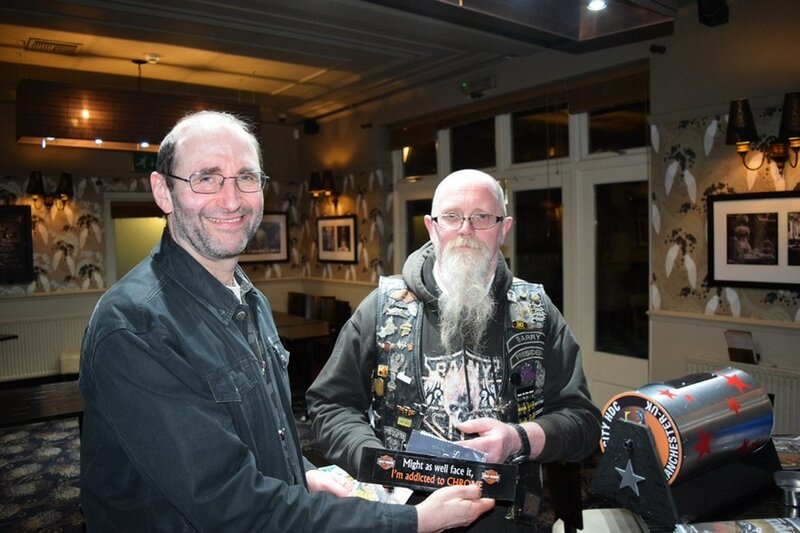 Kevin presented the month's flyers and demonstrated a 'stealth' hoodie, which Barry had ordered in response to some comments about the 'PIG IN A PUDDLE' logo. It was embroidered in black cotton onto a black hoodie and was very well received - let's see if orders follow! Ken did a' regular' 3-part quiz, which was popular, although no-one had remembered to bring the prizes for the winners - doh ! Mal did the raffle - again without prizes! 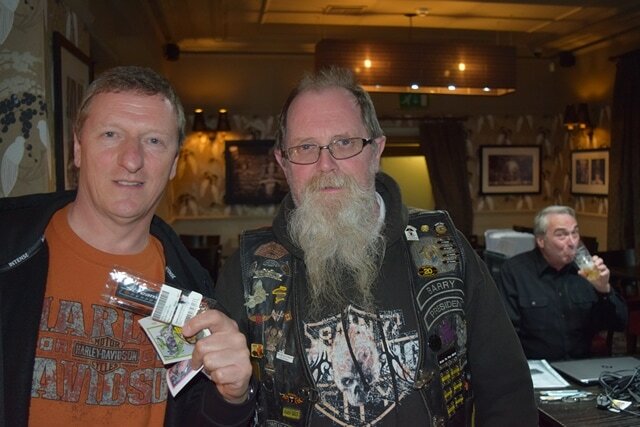 Jon issued IOUs to the winners for encashment at the next meeting, if Barry remembers to bring extra prizes! Andy you don't care as long as you have a picture with Mal.! Is that a pretend IOU? 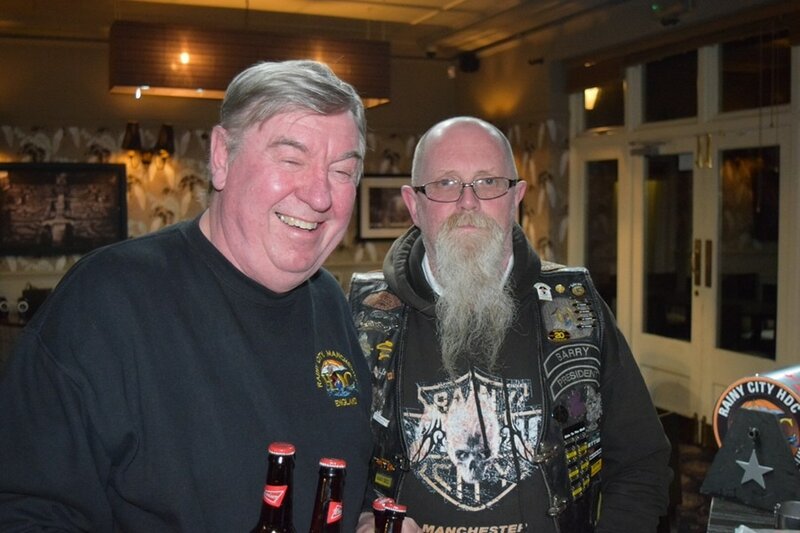 Barry gave an update on TONY BAILEY'S condition and confirmed that it was 'open visiting' from 9am to 8pm at St Anne's Hospice in Little Hulton near Bolton. 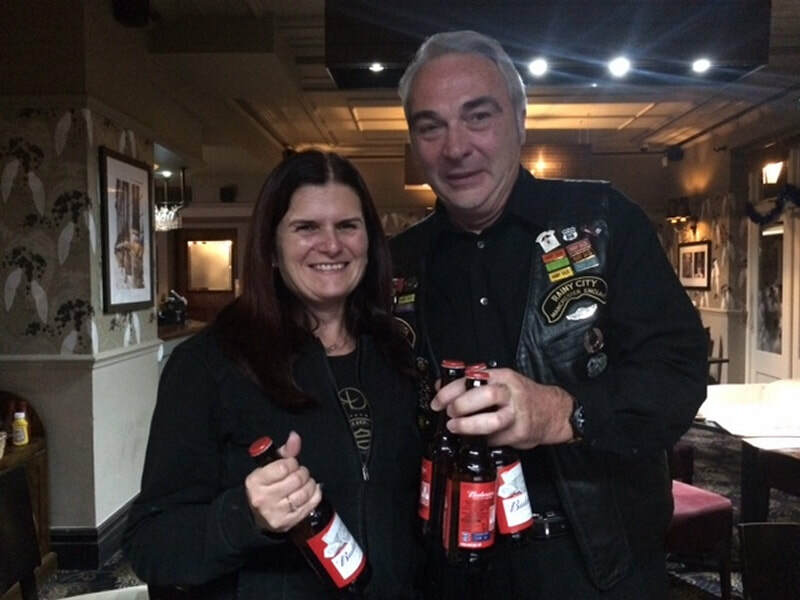 He also mentioned that former founder member JACQUI GREATOREX had recently died and her funeral service would be on Monday 2nd October for anyone wishing to attend. He reminded everyone that the October meeting would be the club's AGM with FREE food. He also asked that members please get their membership renewals in BEFORE the meeting to speed things up, and that nominations for Committee Membership also needing sending ASAP. XMAS PARTY - Bookings still being taken as extra rooms were being made available by the hotel. GERMANY TRIP 2018 - Deposits of £25pp are required urgently, so Barry can book ferries and tickets. EMBROIDERY - samples of the new 'black on black' embroidery were passed around for viewing. 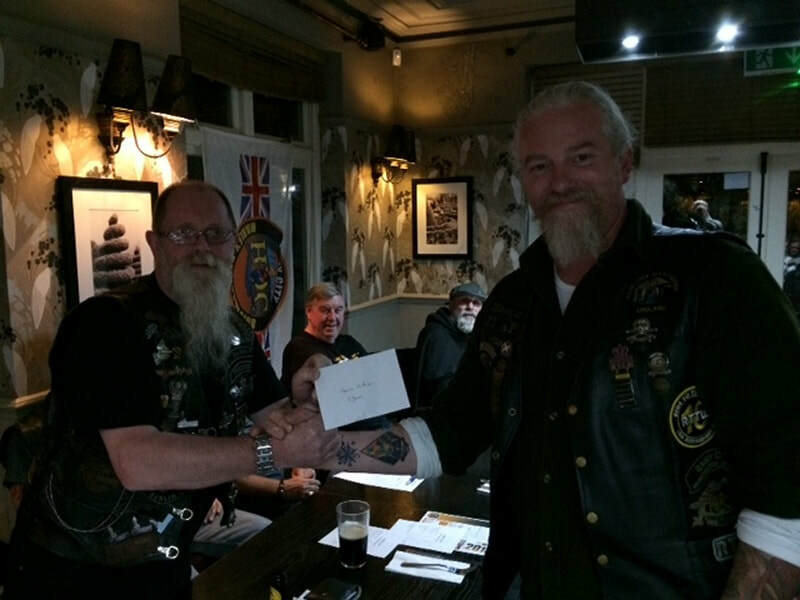 After that, Barry and Mal ran the raffle and Ken did the quiz. Well done Ian, it's habit forming. Steve seems to have an addiction for winning raffle prizes. Well ! Lady Margaret is this going to be the start of a new hobby? Well it was another busy AGM 9 I believe - unfortunately dates clashed with mine & Helen's annual holiday so I couldn't attend but the following report was kindly put together by Kevin. Everyone stood down from the committee and all were re-elected apart from Barry Dunnett, who had decided to stand down earlier in the year. One new member was also elected as a Committee Member – namely, Andy Bond. 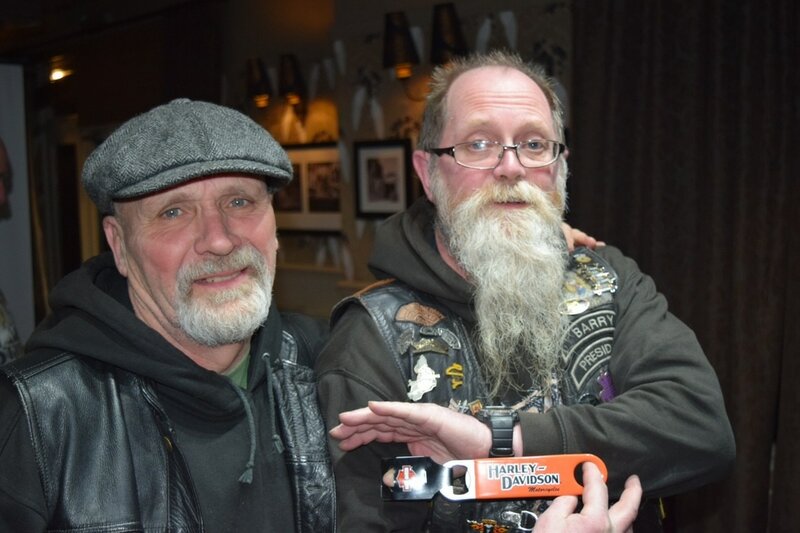 Barry presented Year Bars to several absent members, but those present were Mal Hyslop, who received a 15-YEAR bar, Martin ‘Moo’ McBride and Andy Bond, both 5-YEARS. 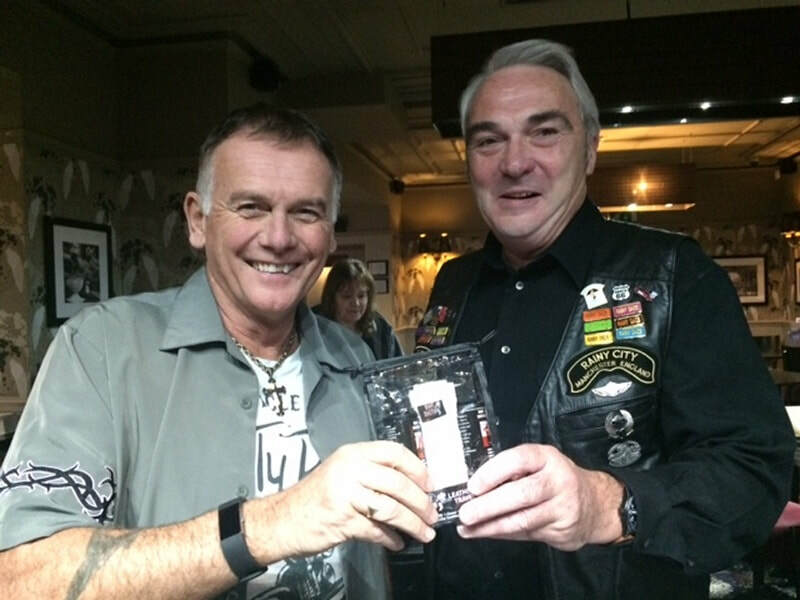 On behalf of all the club membership, Chris presented Barry with novelty antique ‘Antique Gas Pump Drinks Dispenser’ as well as a bottle of 20-year old Beam Bourbon. 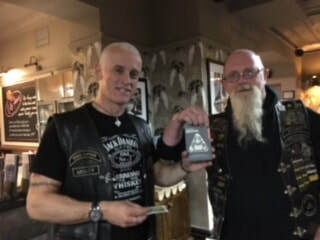 Jon Dailey then presented Barry with a patch bearing the insignia ‘LIFE-VICE’ to go over the top of his ‘PRESIDENT’ patch. 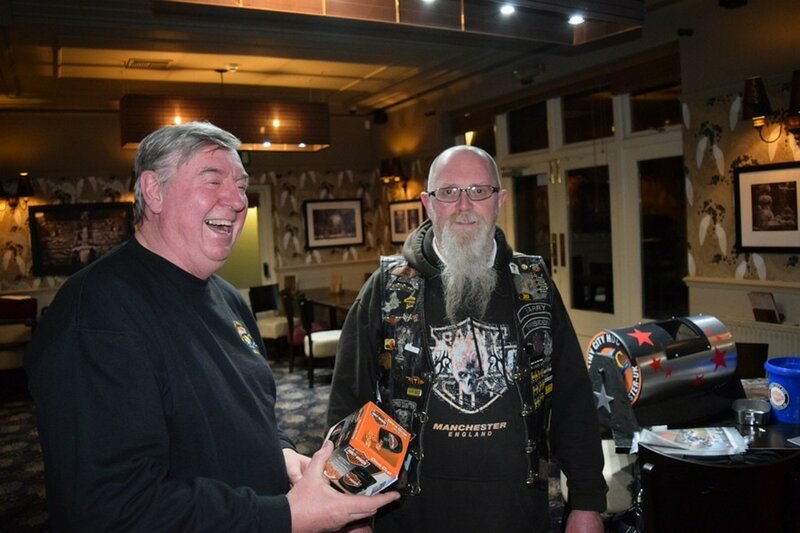 And finally, on behalf of the T.W.A.T.S., Kev Carroll presented Barry with a commemorative trophy of a pair of HD pistons mounted above a clutch plate, suspended on 2 TESCO trolley legs! 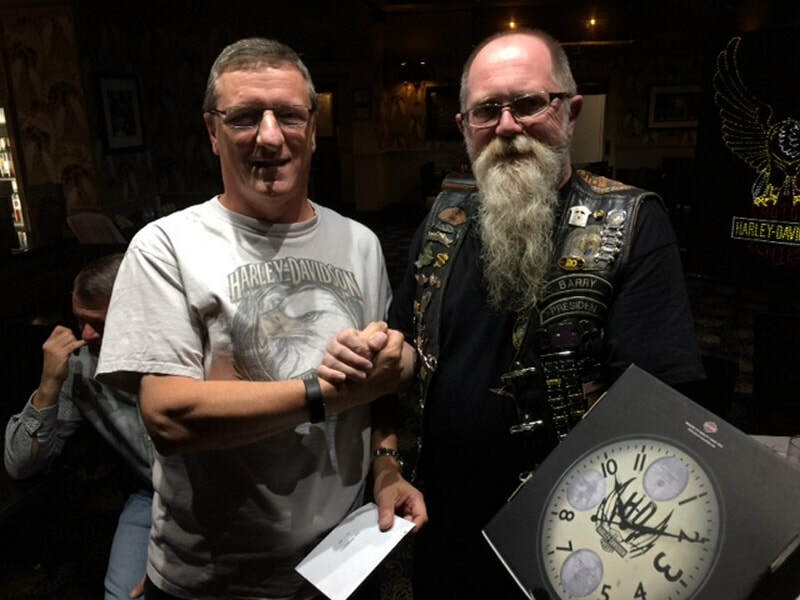 A very nice Harley wall clock (kindly donated by Patrick Yates of HARELYWORLD) was won by Ian Bottomley. As there was no other business, the food was served and consumed! Chris McDonald opened the meeting with a message of 'WELCOME' to a new face in the audience of 22 members - namely, Barry Dunnett! He then went on to say a big 'THANK YOU' to everyone who helped make last weekend's Christmas Party such a success, yet again. 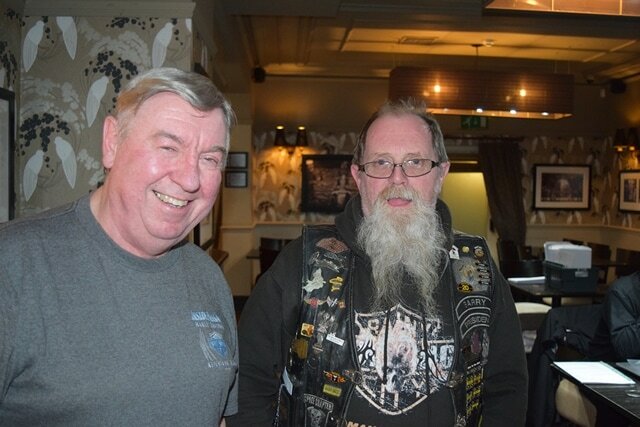 We had 52 people in attendance over a 4-day period and raised over £200 from Mal's infamous raffle. 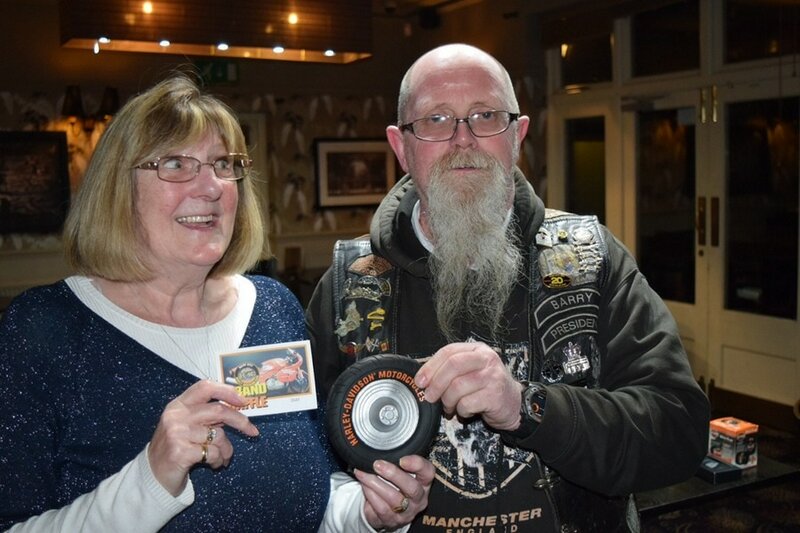 In addition to the raffle monies, Jon Dailey reported that the 'HEADS & TAILS' game raised £65, which was given to the winner's choice of charity. 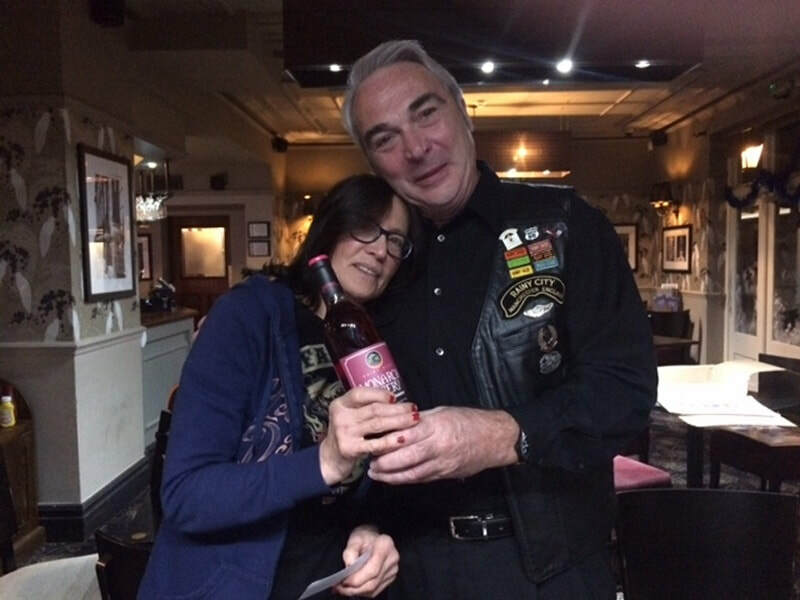 The winner was HARLEYWORLD boss Patrick Yates, who chose Breast Cancer UK. 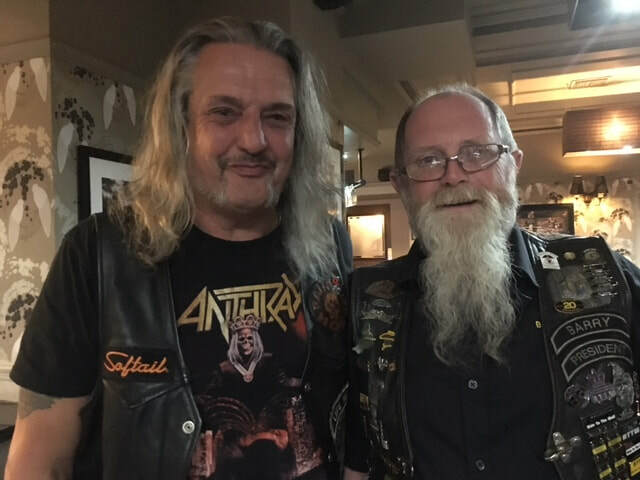 Patrick had been very complimentary about how much he enjoyed the party and asked if he could bring the Director of his HOG chapter next year! 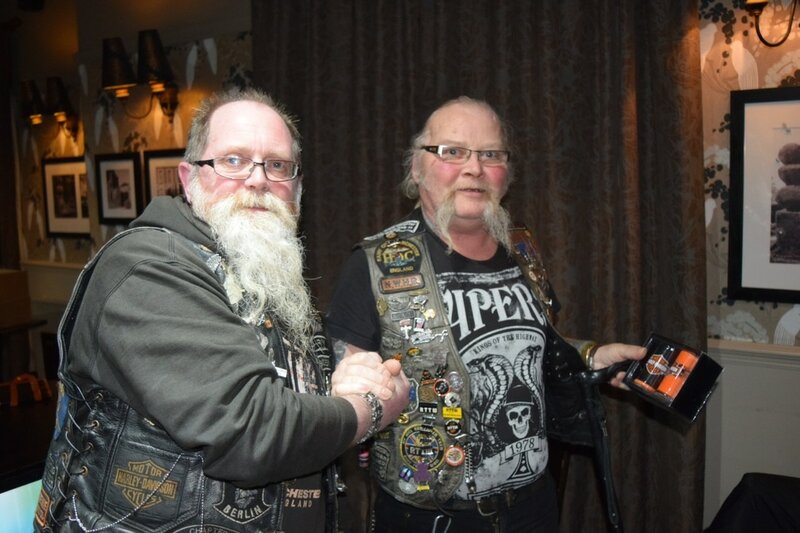 We further agreed to match the £65 with club funds for a donation to ST. ANNE'S HOSPICE at Little Lever, Bolton, which had looked after member Tony Bailey so well during his final days. Chris then recounted an amusing tale about being fined £100 for driving with a dodgy-spaced number plate - hopefully, the full story will be in the Xmas issue of HOGWASH. 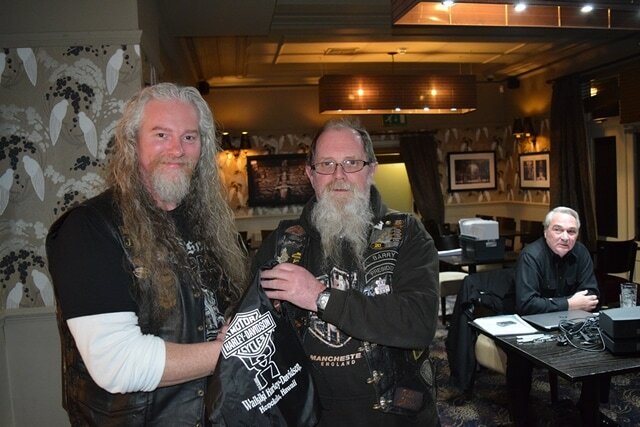 Jon Dailey then presented new committee member ANDY BOND with his committee patch. 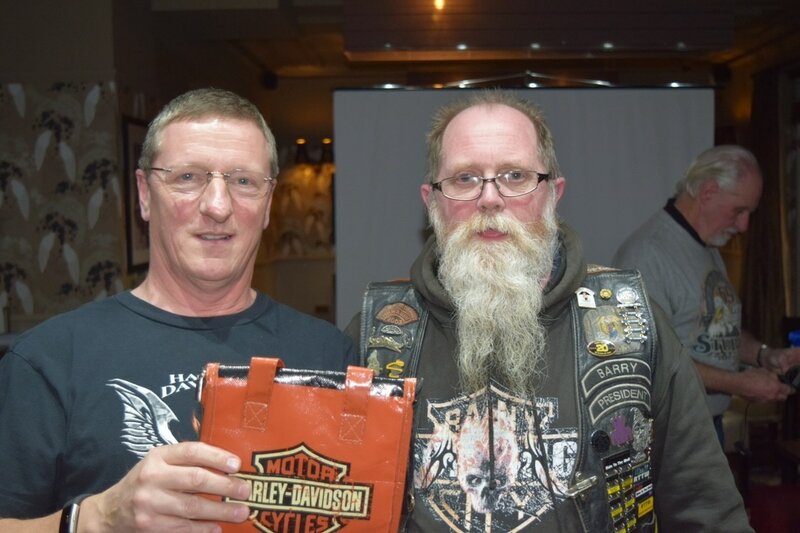 Kev Carroll presented the events flyers as usual, followed by Bill Malley who unveiled details about next year's club 'Road Trip to the HOG'N'BOG rally in Northern Ireland next August. Ken Vickery then hosted a festive quiz, which was followed by the raffle presented by Mal and Chris. Up at the front again Andy, hat's a quick change of outfit...! Well Lady Margaret, not to shy now you're a regular winner. and finally here's Anita collecting the Raffle prize...the right one in time for Christmas. Well that's it for this year's meeting, don't forget there is no meeting in December, however we will be meeting at the HardRock in Manchester (Printworks) Thursday 28th Dec from 7:30pm and then onto Chiquito's for some food.